If the results are grouped, the legend div overlays the list of result. That's not the case when the changes are not grouped. The alignement is not related to grouped changes by pages. German Wikipedia has a misaligned legend that overlays the other options. 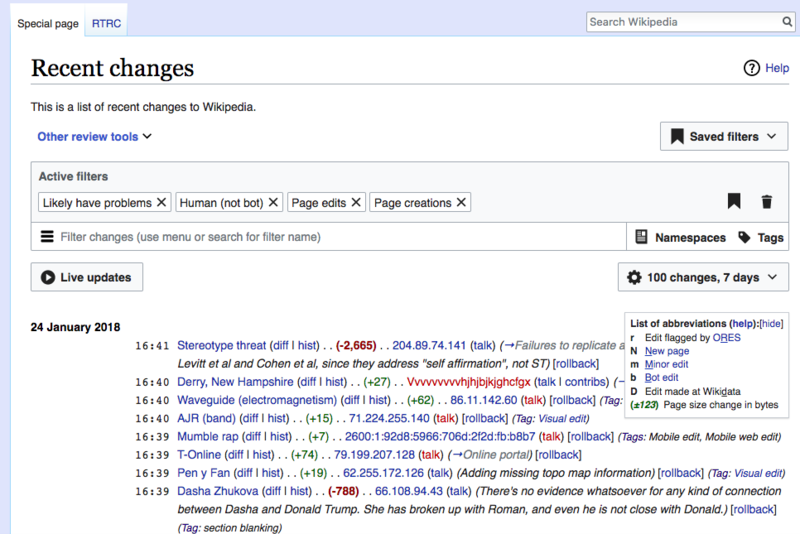 Same thing on French Wikipedia, that have a customization on the local CSS file. Catalan Wikipedia is correct: legend is inside of the fieldset and is not overlaying. That's the same on English Wiktionary, Mediawiki.org, Hebrew Wikipedia. I haven't seen how much local customisations are impacting the legend. The issue seems to me as a possible regression of T174728: "Legend" retains some space if "Group results by change" is enabled - I will look into it. There was the same issue in enwiki at some point. From the sceenshots I see that two variants of the Legend are present - one is with the links (and underscores) and another without links. I'll need to look into it too. I checked in Chrome and FF, full-screen, and also, as in the screenshot for German Wikipedia, I changed the UI language to English to see if it may push the Legend to overflow - did not see the issue. Additionally, I checked the Watchlist - no issue there either. Aklapper added subscribers: IKhitron, eranroz. Trizek-WMF added a subscriber: Beta16. @Beta16: what is your browser, and which version? @Etonkovidova, I still have that issue on Chromium last version on fr.wp. @Trizek-WMF unfortunately I do not have Chromium around... Can you verify that dewiki has the same problem as it was reported in the ticket? Also, do you have any custom CSS? @Trizek-WMF unfortunately I do not have Chromium around... Can you verify that dewiki has the same problem as it was reported in the ticket? Also, do you have any custom CSS? @Trizek-WMF yes, the issue with overlaying is present. I've confused my self with T182156: RecentChanges legend overlaps actual RecentChanges. Hi Trizek, I'm using Google Chrome version 63.0.3239.132 (64 bit). instead, with "Group results by page" not active, the page shows the results correctly with "List of abbreviations" box near to the results list. I can confirm the problem in Mac Chrome. I checked in Chrome and FF, full-screen, and also, as in the screenshot for German Wikipedia, I changed the UI language to English to >see if it may push the Legend to overflow - did not see the issue. Additionally, I checked the Watchlist - no issue there either. The issue that you've confirmed it's #1 and seems to be a duplicate to T182156 (nobody argues that it exists). I am more concerned about #2 which could be a possible regression, but I could not confirm it anywhere. Resolved as per the fix in T184165: Legend on Recent changes is misaligned and overlaying results on some wikis.